The G-Shock Vintage Rose Gold Master of G Collection features fashionable rose gold bezels and accents for a vintage look. 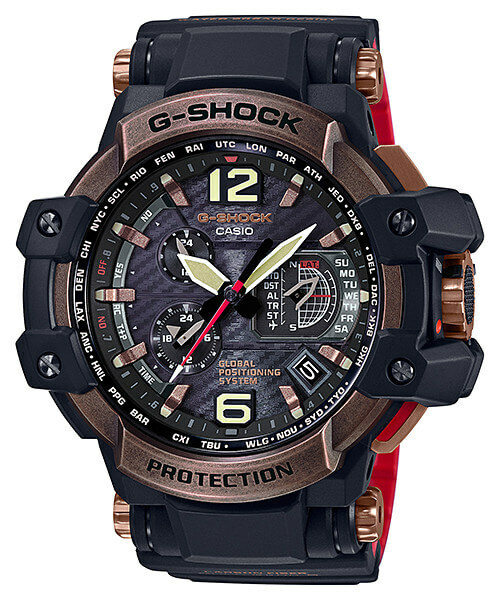 This series includes models from all three categories of the Master of G series including land (Mudmaster), sea (Gulfmaster), and air (Gravitymaster). Representing the Gravitymaster line are the GA-1100RG-1AJF and the limited edition GPW-1000RG-1AJF (limited to 500 units worldwide). 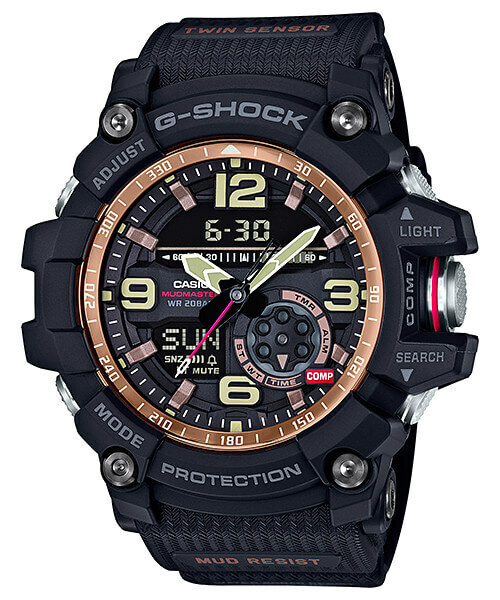 The other two models are the Mudmaster GG-1000RG-1AJF and Gulfmaster GN-1000RG-1AJF. 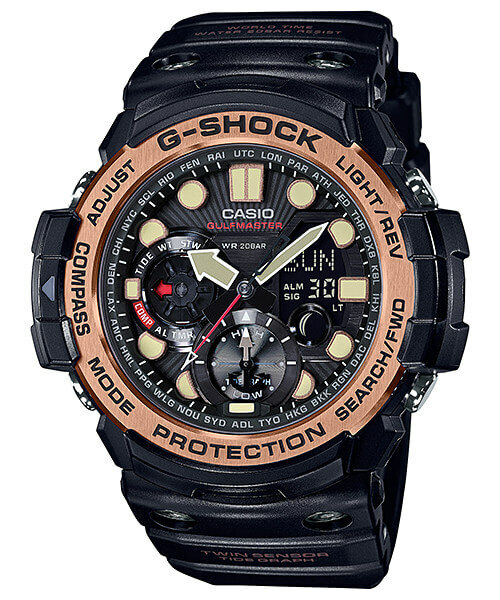 All models except for the GPW-1000RG-1AJF have the Twin Sensor with compass and thermometer. The Gulfmaster also has a tide and moon graph. The GPW-1000RG-1AJF features an aged IP treatment and has GPS Hybrid Wave Ceptor which combines Multi-Band 6 radio timekeeping with GPS satellite timekeeping. Update: Casio America announced the Gravitymaster GA1100RG-1A (list price $250), Mudmaster GG1000RG-1A (list price $320), Gulfmaster GN1000RG-1A (list price $300), and Gravitymaster GPW1000RG-1A (list price $1,000) for a February 2017 release. The GA-1100RG-1A has a rose gold stainless steel bezel and index. 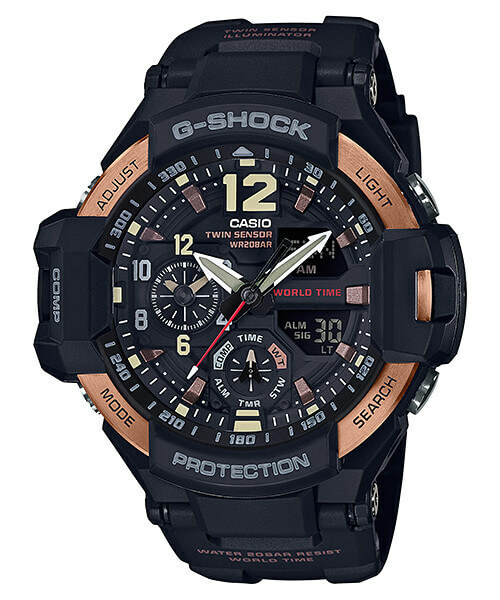 The GG-1000RG-1A has a rose gold dial ring and index. The GN-1000RG-1A has a rose gold stainless steel bezel. The GPW-1000RG-1A has an aged rose gold bezel, index, band screws, crown, and buttons. It also has a dual-layer carbon fiber insert band with a red inner layer. List price is ¥110,000 JPY.